In the spring and summer, I try to put down my knitting for a while and work on a few warm weather projects. 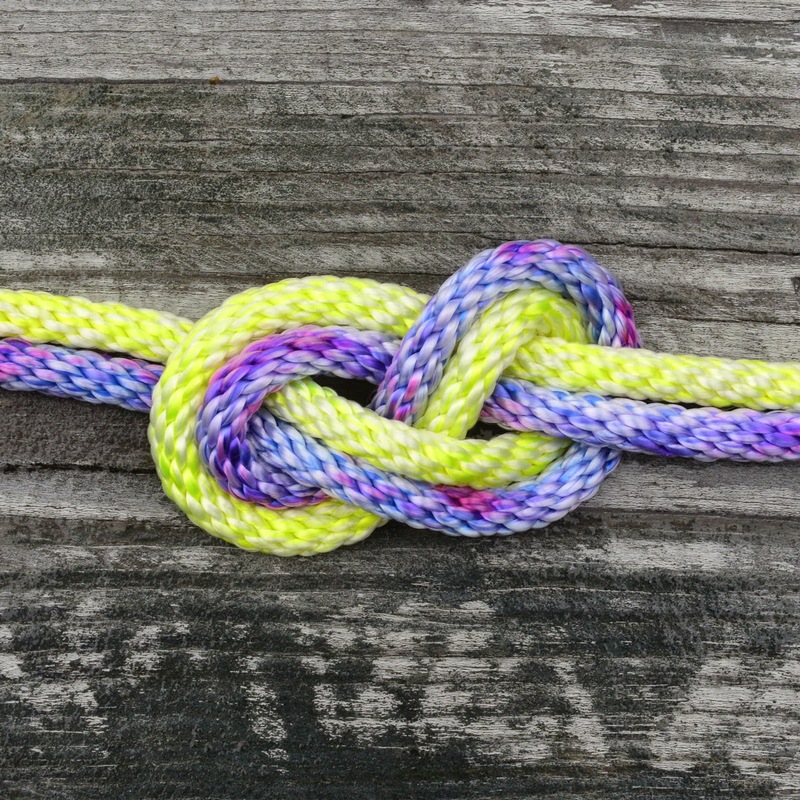 Rope is one of my favorite materials because it is cheap and readily available at the hardware store, even in bright colors. 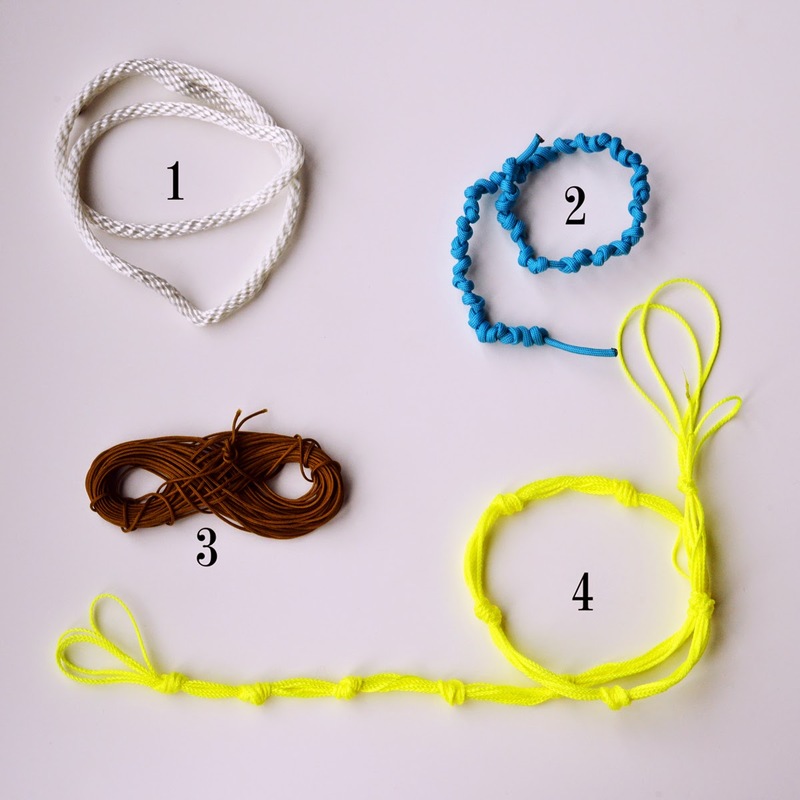 I have a lot of jewelry ideas right now that will use rope, but I want some color variation that I can't get at the store, so before I start working on these rope crafts, I am going to dye some rope. The type of rope you use is the most important thing to pay attention to. In order for the dye to set, you need to use nylon rope or a nylon blend. 1. 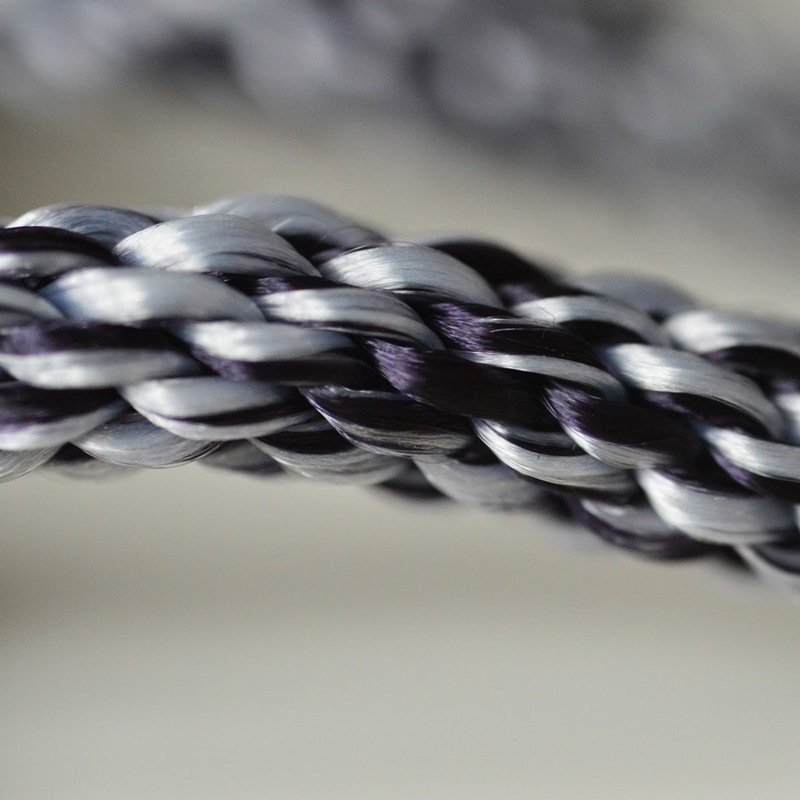 Nylon/poly 1/4" braided clothesline - this will not dye completely, the result is a sporty 2 tone look that is very unique. You can also find this rope in 100% nylon. 2. Nylon Paracord - I have only come across nylon paracord, so if you have some that is unmarked, it is worth a try. 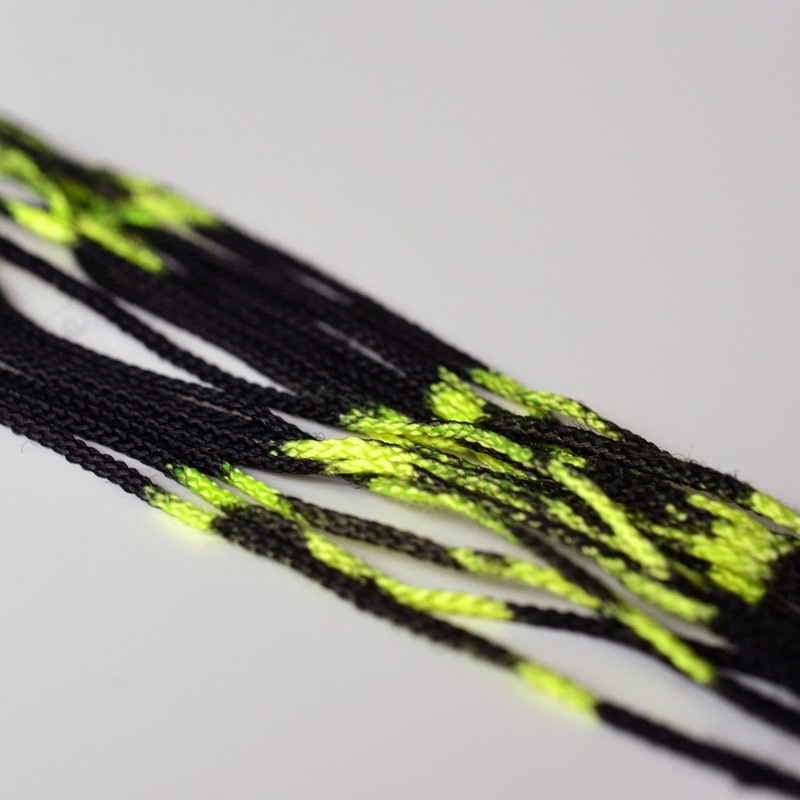 I have knotted the cord tightly to create a pattern where the original color is left in some places. 3. Chinese knotting cord - this is from the craft store, it is a tight braided rope that looks a lot like very thin paracord. I want this to be totally saturated with the black dye, so i wound it around my fingers into a loose skein and secured the ends together. Tying the ends around the skein will leave dashes of the original color. 4. Nylon Mason Line - mason line in neon colors is fun, but to get a yellow and black rope, I folded 8 yards in half a few times, then tied a knot every few inches where the dye will not soak in. 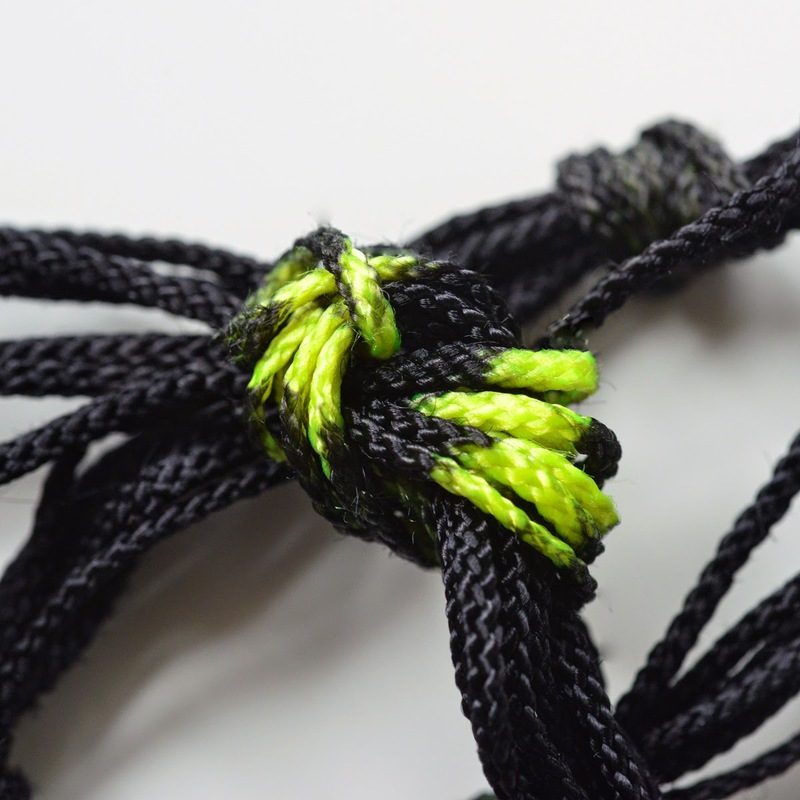 To color the rope, you will need acid dye or food coloring. Here are 5 different kinds of dye that will color your rope. 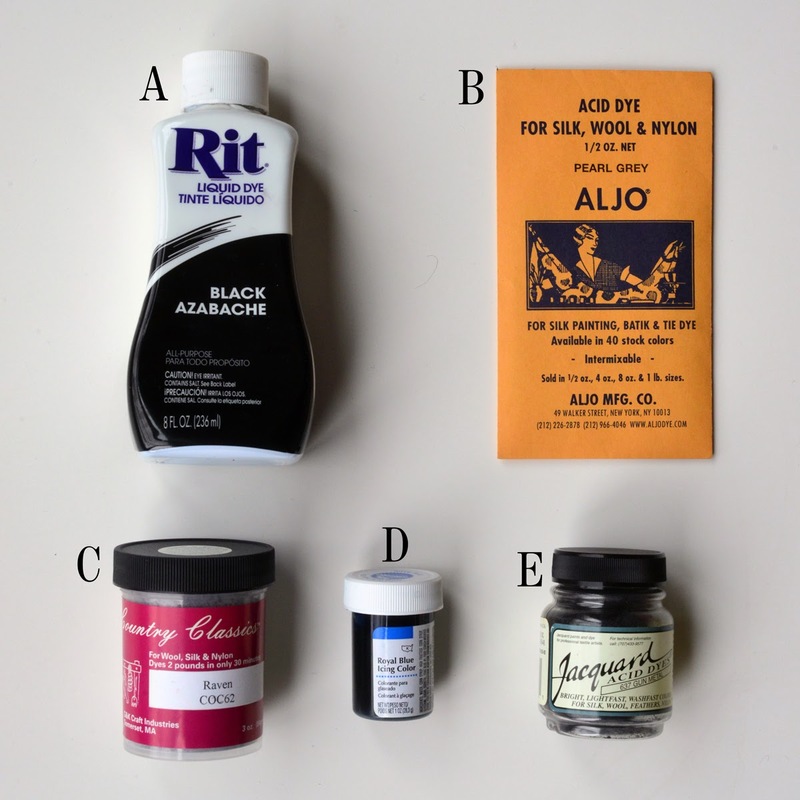 A. Rit Dye - This is an easy to find brand, but not the best choice if you only need an acid dye. Rit is made to color multiple materials, so some color will wash out. If you use this, follow the instructions for dying wool on the label. You will need to add vinegar to the dyebath. B. Aljo acid dyes - I just got a bunch of these because they are made locally and are available in bulk. This is what commercial companies use. In the package there is a dye powder, you will need to add an acid, such as vinegar, to the dyebath to set the color. C. Country Classic dyes - This is what I am using on my rope. This dye comes in about 50 colors and is pre mixed so nothing needs to be added to the dyebath other than this powder. The black color (raven) is true black, unlike Rit or food coloring dyes. D. Food Coloring - Food coloring will dye nylon, and it can give great unique results. You will need to add an acid to the dyebath and cook on medium heat for the dye to set. This is the easiest dye to get, but the hardest to predict. Don't expect the color to look the same as it does on thee label. E. Jaquard acid dye - I get these at the art store, it is hobby quality and comparable in price to Country Classics. I have found that the colors are hard to predict and are often different than the colors on the label. You need to add an acid to the dyebath in order for the dye to set. 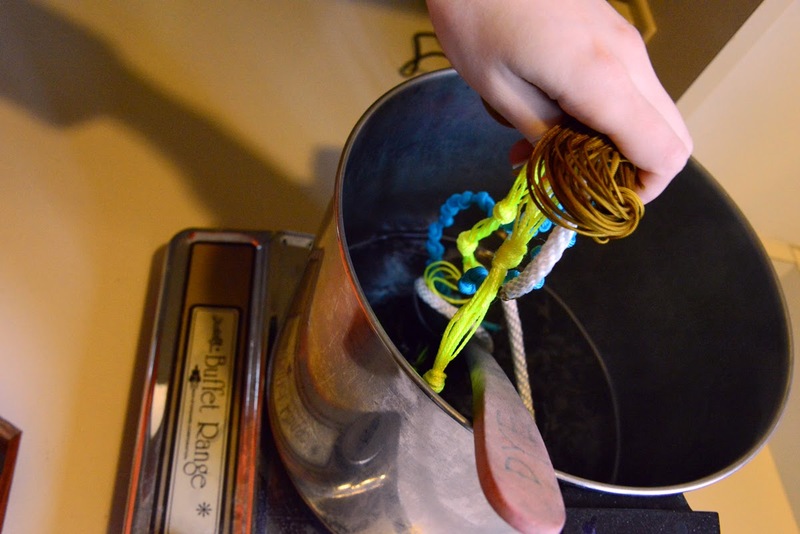 With my dye color and rope picked out, I heated my dyepot until the water was simmering. You will get the best results by following the instructions on the dye package or these instructions for dyeing nylon with food coloring. DO NOT USE DYE IN A POT THAT YOU USE TO COOK. 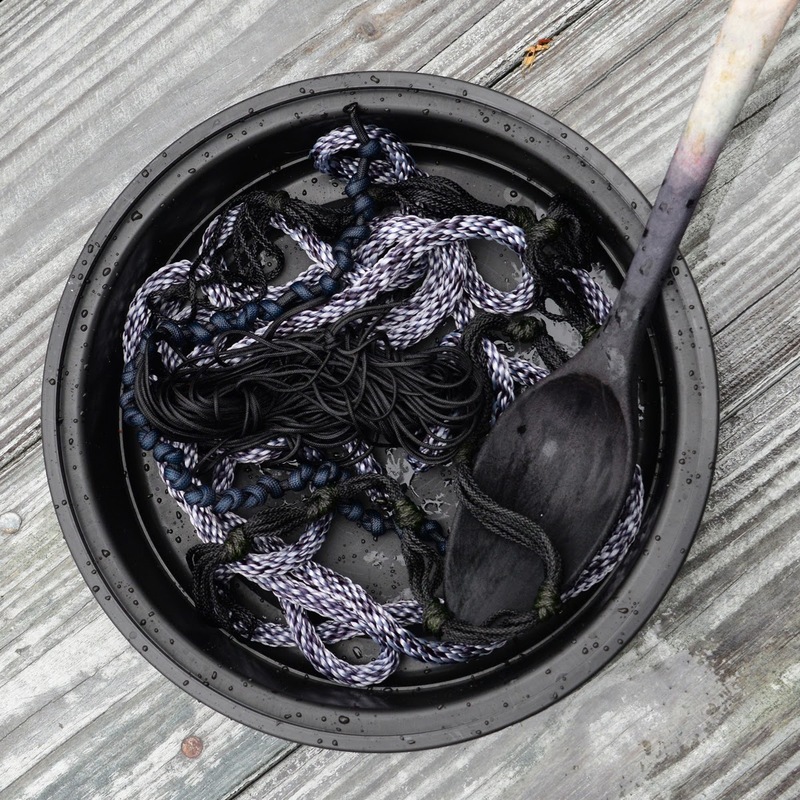 After about 15 minutes, all but the paracord is black, so I take out the other ropes and leae the paracord in the dyebath with some extra color added for another 15 m.
The ropes are then put into a NON FOOD Tupperware and are rinsed. As the ropes are untied, the original colors come through. The tie dyed mason line is more interesting than plain neon colors. 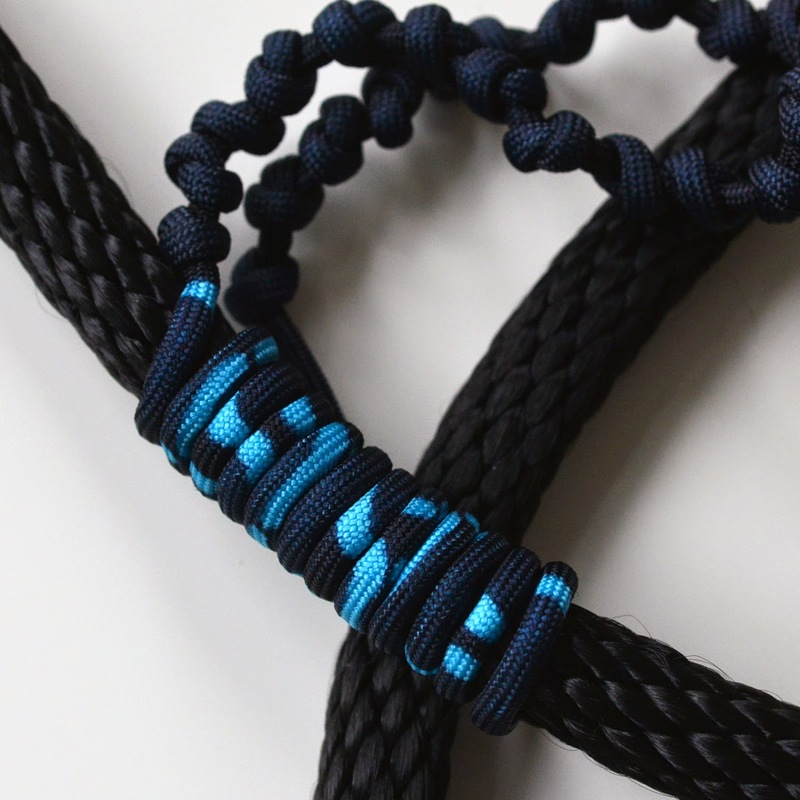 The paracord looks great when wrapped around a bigger rope. You can see how the blended rope takes dye differently than the other ropes. I will be posting more pictures projects for rope as I make more colors. So come back and visit to see some solid colored clothesline and bright colors that can be used to make jewelry. I've never thought about dyeing rope for crafting before. Thanks for the inspiration!